Fuschl am See is an Austrian municipality in the district of Salzburg-Umgebung, in the state of Salzburg. It is located at the east end of the Fuschlsee, between the city of Salzburg and Bad Ischl. The community has 1,406 inhabitants. Fuschl am See covers an area of 21.4 km². 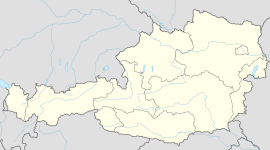 The city lies in the mid-northern part of Austria near the German state of Bavaria. Red Bull has its headquarters in Fuschl. Highway B158 from Bad Ischl to Salzburg passes through Fuschl. ^ Spurgeon, Brad (2005-06-17). "Motor Racing: Formula One shows off a fast, young American". International Herald Tribune. Retrieved 2009-01-31. ^ Fantel, Hans (1993-03-14). "A Back-Road Drive to Vienna". The New York Times. Retrieved 2009-01-31. Wikimedia Commons has media related to Fuschl am See.